Quinton Fausey has always been interested in metalworking. A self-taught blacksmith, the 18-year-old Pennfield High School senior spent close to a year making tools and other items out of metal at his home in Bellevue before starting the Industrial Welding Program at KCC his sophomore year. Today, instead of spending his days in chair in a classroom, Fausey finds himself working with fire and metal as he pursues a degree that could lead directly to career. It’s a lot different environment than the one in his more traditional high school classes. Fausey is dual enrolling at KCC through the Calhoun Area Career Center and KCC’s early college program. He’ll walk at commencement with his high school class this spring, continue training at KCC this summer and fall and graduate from KCC with an Associate in Applied Science degree in Industrial Welding in December. For Fausey, welding was a natural next step in line with his interests. Fausey studies welding at KCC’s Regional Manufacturing Technology campus, located in the Fort Custer Industrial Park in Battle Creek. In addition to completing his education at the center, connections there also helped him land a job at nearby Rocket Machining & Design in Springfield. The job allows him to put some of his studies into practice, particularly his machining electives. 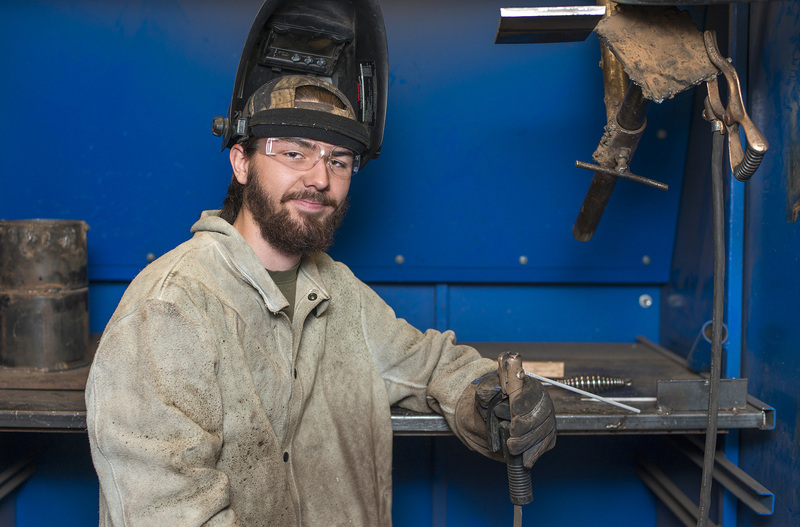 After graduation, Fausey says he wants to continue welding, and he’s thought about pursuing an apprenticeship in machining, though he’d like to do something that offers a good balance of both. Wherever he ends up, KCC’s given him a good head start over his peers; many of them will just be finishing their first semester of college while he’s graduating with a degree.